U.S. Rep. Alexandria Ocasio-Cortez (center) poses with AMP members. 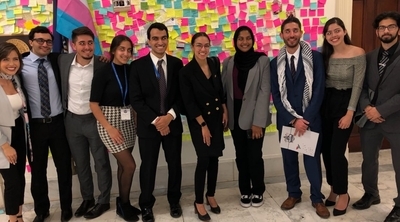 Members of the rabidly anti-Israel group American Muslims for Palestine (AMP) met this week with U.S. Reps. Rashida Tlaib, D-Mich., and Alexandria Ocasio-Cortez, D-N.Y., during the group's annual Palestine Advocacy Day. Ocasio-Cortez posed for a photo with AMP supporters outside her office on Capitol Hill, an AMP newsletter posted online shows. However, nothing was posted online saying what Ocasio-Cortez said to the AMP supporters. 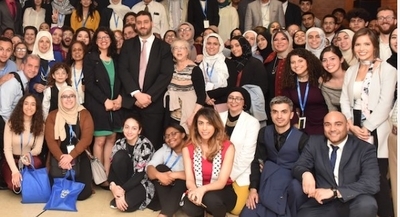 Tlaib spoke to the group Monday, saying that she feels "more Palestinian" in Congress than she does anywhere else in the world. AMP is the successor and alter ego of a defunct Hamas front called that formerly operated as the Islamic Association for Palestine (IAP)/American Muslim Society (AMS), a lawsuit filed in Illinois federal court claims. The IAP/AMS acted as the propaganda arm of the Muslim Brotherhood's Palestine Committee, a network of U.S.-based organizations established to support Hamas politically and financially. Former Hamas political bureau chief Moussa Abu Marzook created several organizations that formed the Palestine Committee and served on IAP's board of directors prior to his deportation in the 1990s. A federal court awarded Joyce and Stanley Boim $156 million in damages in 2004 in connection with the murder of their son, David, an American citizen, in a 1996 Hamas terrorist attack. IAP/AMS were among the entities held liable. Group leaders announced they were ceasing operations not long after that court decision. The new lawsuit aims to hold AMP liable for the IAP/AMS's damages from the original litigation. Many IAP/AMS officers now work with AMP, including AMP Chairman Hatem Bazian, a University of California, Berkeley lecturer. Bazian and other former IAP/AMS leaders used a Yahoo! Bulletin board to discuss the "transition" to the group that eventually became AMP in 2006, the newer lawsuit said. Palestine Advocacy Day included at least 500 participants from 32 states, AMP organizers claimed. They said they met with people in 191 Capitol Hill offices. Their lobbying effort focused on fighting legislation barring governmental support for organizations that support the Boycott, Divestment, Sanctions (BDS) movement, for a bill supporting Palestinian children's rights, and for humanitarian aid and rights for people living in the Gaza Strip. AMP Executive Director Osama Abuirshaid, who served as editor of IAP's Al-Zaitounah publication and referred to Hamas as an "army for liberation" in 2014, introduced Tlaib. Abuirshaid also worked as a research fellow with the United Association for Studies and Research (UASR), one of the Palestine Committee entities established by Hamas leader Marzook. U.S. Rep. Rashida Tlaib (second row in blazer and green dress) poses with AMP members during "Palestine Advocacy Day." In videotaped remarks posted by AMP, Tlaib encouraged AMP members to fight for immigration issues and LGBT rights on par with Palestinian issues. "What is AMP doing about what's happening at the border? Because to me that's another form of what's happening in Gaza, where people are literally ripped, children ripped apart from them but dealing with the fact that they're being caged, and all of – the tragedy," Tlaib said. "That's what our country is doing right here. And I say this to all of you, like, I think of [Palestine] when I see that." Tlaib compared BDS with the Montgomery bus boycott, asking where America would have been without it. "And no one should say to us that that isn't protected First Amendment right. It absolutely is," Tlaib said, referring to anti-BDS legislation. Ocasio-Cortez and Tlaib claim they, like fellow freshman U.S. Rep. Ilhan Omar, D-Minn., are simply critics of Israeli actions. But in meeting with AMP, the two congresswomen bolstered the credibility of a group that wishes to see Israel eliminated and which has clear ties to an old Hamas support network.